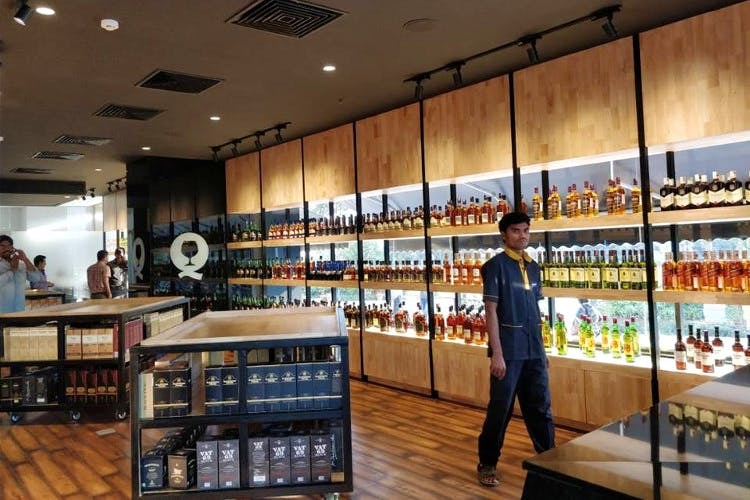 Q By Tonique is located in Manjeera Trinity Corporate and this is probably the first liquor mart in Kukatpally where you can walk in and take your pick from the great selection. As the name suggests, this liquor mart belongs to Tonique, and the ambience is quite similar. As you walk in, you'll be welcomed by a large counter with a vast collection of miniatures behind. Everything from Vat 69 to Black Dog and The Glenlivet, Chivas Regal and Teachers 50 are on offer. And what’s not to love? The prices begin at just INR 110. A great selection of single malts and blended whiskeys like Talisker, Glenlivet along with cognac such as Remy Martin, Hennessy are put on display. The wine is categorised country-wise and you’ll find New World wines from South Africa, GMH from Australia, Frontera from Chile, and several others from New Zealand, the United States, and Saudi Arabia. Then there’s also Aussie favourites like Jacobs’s Creek and Yellow Tail available. The exotic ones rub shoulders with the local favourites like Krsma and Sula. Their extensive collection also boasts of Old World wines from Europe and champagne of course with sparkling wines too. So, if you are looking for good alcohol, you don't have to travel till Jubilee Hills anymore. Get here and stock up your choice of poison! Unlike the main branch, this one doesn't have drinkware or several snack options. We'd love to see more of these.